OUR OLIVE OIL - Ristorante San Michele all'Arco - Firenze. 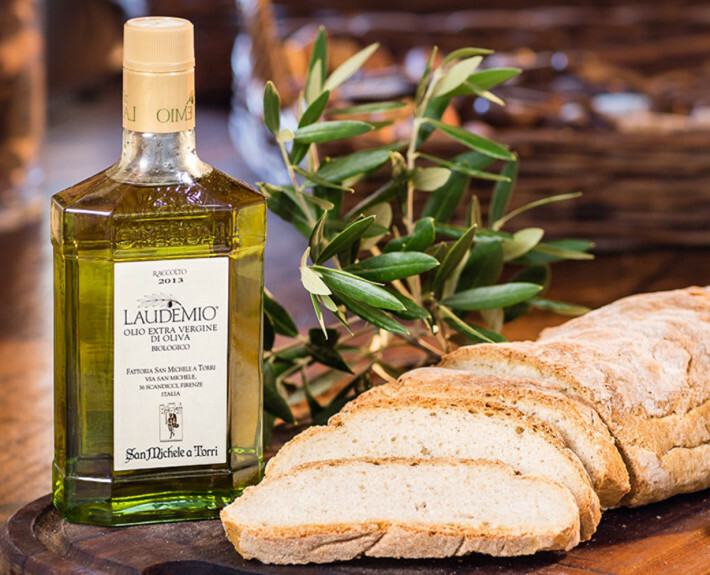 Our organic extra-virgin olive oil from Fattoria San Michele a Torri is a blend of Frantoio and Moraiolo olives and a small amount of Leccino, Pendolino and Cerretana olives. Olives are manually harvested at the right degree of ripeness, usually the end of October/beginning of November. The pressing takes place in selected mills, within 24 hours of harvesting. The resulting oil is soon filtered in order to preserve the excellent organoleptic and nutritional properties. Characterized by a low acid content (0.15% expressed as Oleic acid), an optimal polyphenol content (300 mg/lt) and a remarkable tocopherol concentration (280 mg/lt). Our Laudemio has a herbaceous fruity olive taste with a hint of spice at the finish.